Solar energy is energy from the sun in the form of radiated heat and light. Solar power is the conversion of sunlight into electricity by photovoltaics, solar thermal concentrators, or other technologies. Recent years have seen rapid growth in the number of installations of PV onto building roofs, external building facings, and associated parking areas, and for manufacturing, agriculture, and even entire electric power generation plants. Our Company provides every aspect of this service. 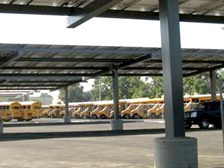 We perform energy audits and efficiency analysis, energy retrofits, green building design and construction or solar remodel; reclaim a landfill or hazardous waste site with a solar generation facility; create an attractive ground based structure, and provide ongoing maintenance and monitoring to ensure your system continues to perform at its peak level. We use only proven equipment to ensure the highest level of reliability and provide the strongest warranty in the industry. We have the most experienced schools team in the United States, and have funding for qualified Schools & Governments. For most commercial customers our Company's break even point for solar facilities will be about three years, the key number most need. With our systems you will control and stabilize your long term energy expense.